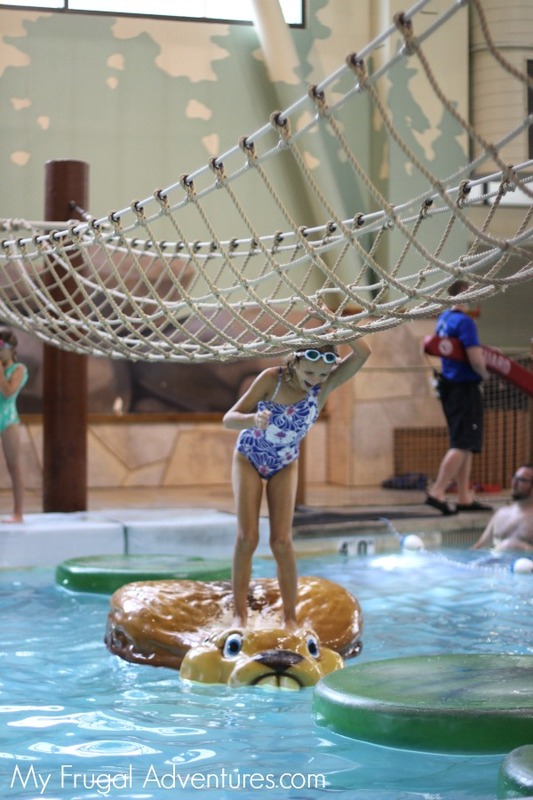 Are you planning a trip to Great Wolf Lodge? Let me tell you my children absolutely love this place. 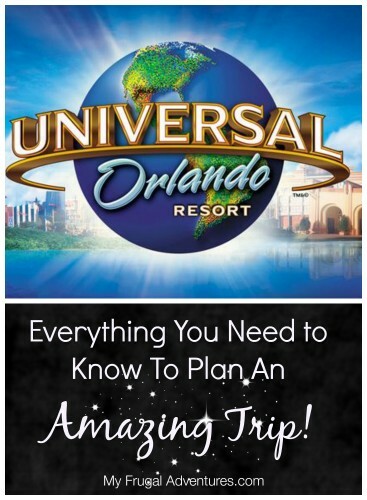 We made a trip about two years ago and the kids still talk about it (they are 7 and 8) – which is impressive considering they have also been to Universal Studios twice and Disneyland twice. Great Wolf seems to have left a big impression on them. We just did our second visit to the Lodge and had a great time. I was kicking myself as we left for all the mental notes I know I made last time and just completely forgot this time around. So I wanted to share some of our experiences at the Lodge with you in the hopes that your little ones love it as much as mine do! There are several Great Wolf Lodge locations around the country so I am sure each one varies a bit. We have been to the one in Grand Mound, Washington. 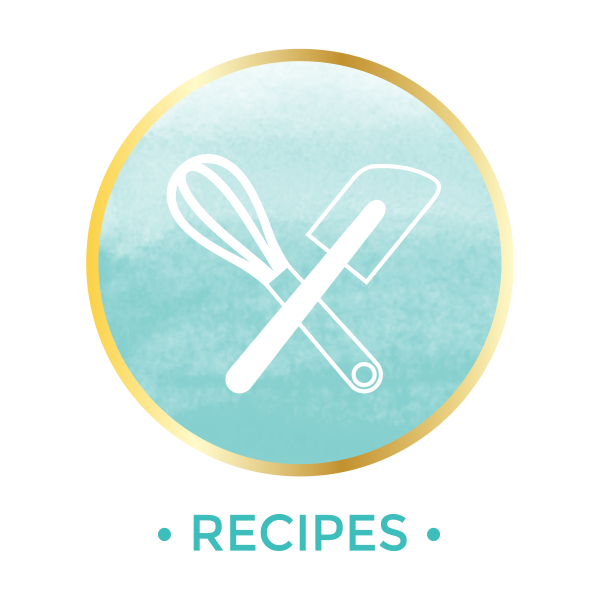 I have researched the various locations and many of these tips to should apply with just a few regional variations. Great Wolf is unlike other amusement park you might be familiar with because it is really intended to be all inclusive. Drive up, park and you don’t need to leave the lodge. The majority of the entertainment seems to be just the waterpark portion of the lodge. 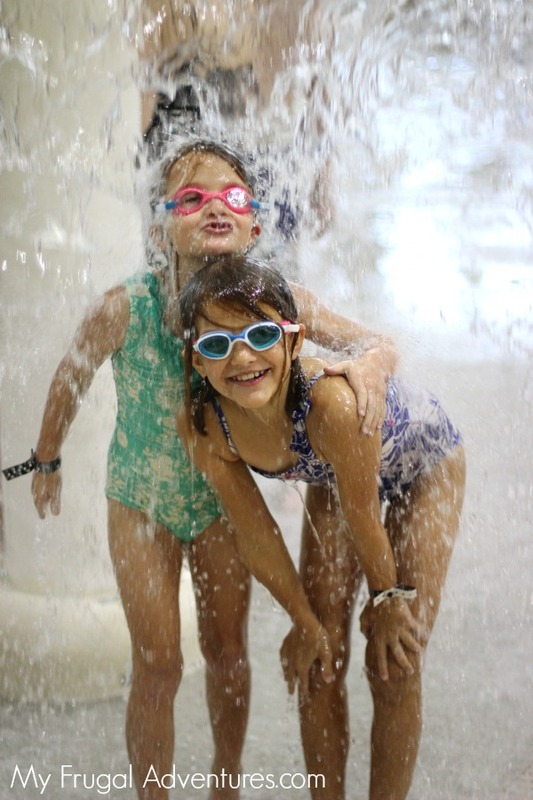 There are several waterslides, a wave pool, a kiddie pool, smaller waterslides, hot tubs (called hot springs) and splash pads for wee ones. The waterpark is great for little ones because there is a lot of space for them to splash around and it is also great for bigger kids. The targeted age range for Great Wolf is 3 years to 15 years old. The wave pool really gets going with huge waves. The waterslides are crazy as well- they went much faster than the waterslides I am used to. You can do single slides with lines that move very quickly, double slides that are slightly slower and 4 man rafts that take the longest. Our average wait was probably 10 minutes for the 4 man rafts and probably 2 minutes for single tube slides. There is a rope climbing thing across a pool that my kids loved and an in-pool basketball area for older kids. 48″ tall is the magic height for the larger water slides. On our first trip, my littlest was not quite tall enough so we had to split up in the water park. This time around my little girl is 49″ tall and was able to go on all the slides with her big sis. The lodge provides life jackets for free. 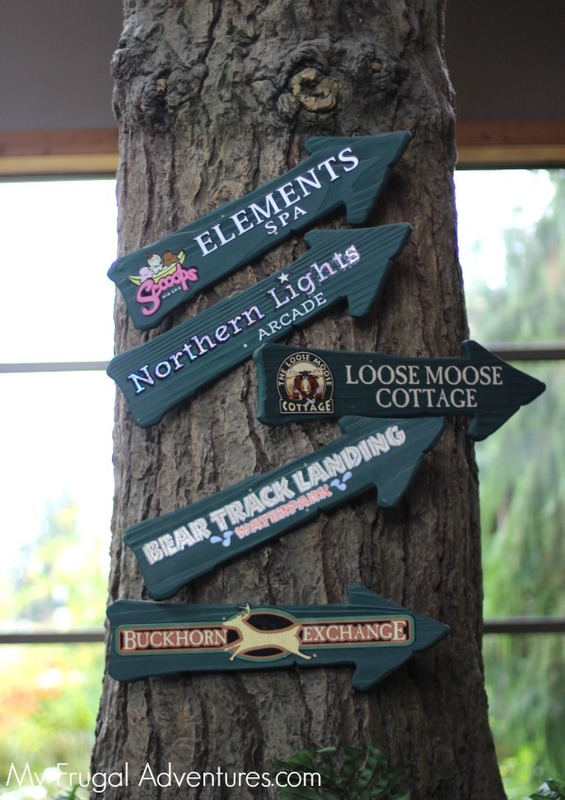 Other entertainment includes the Howler’s Peak, which is an outdoor climbing and ziplining experience, shows/entertainment and games inside the Lodge, a Magiquest game, indoor golfing, an arcade, a children’s spa and a little shopping. 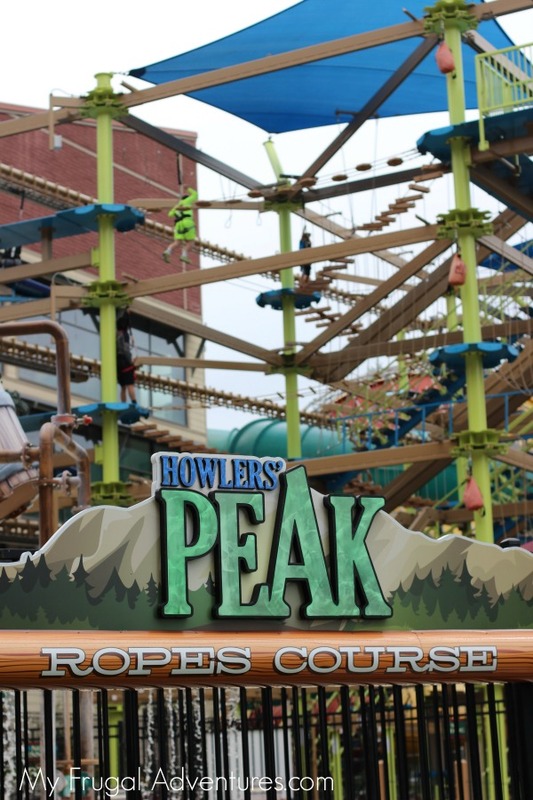 Howler’s Peak and indoor golf are extra and not included with your stay. 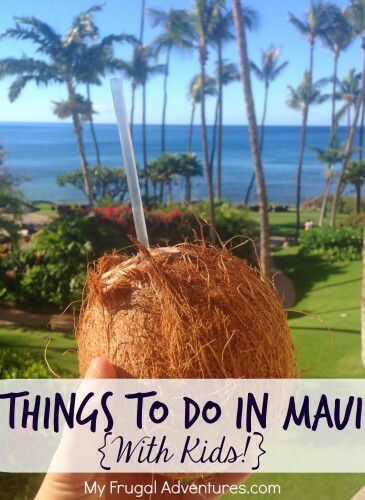 There really is a lot to see and do during your stay. The beauty of the indoor waterpark is that it seemed much cleaner to me than the waterparks in our city. Also the temperature remains the same. When we visit outdoor waterparks the water might be really cold and waiting in lines for the slides can be freezing. Obviously the indoor aspect is wonderful because you can hit Great Wolf year round. The only weather related activity is the Howler’s Peak shown above but we found kids outside on the ropes in the rain. In our area the waterpark was open from 9-9pm daily. 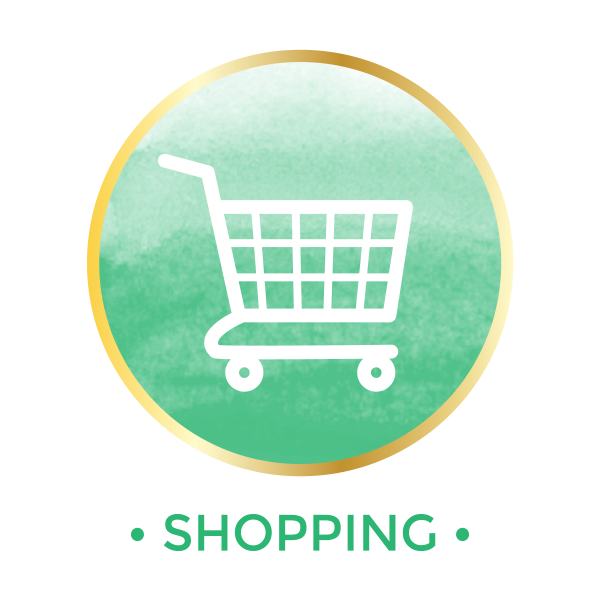 Checkout time is 11am but your wristband will allow you access to everything all day long on your checkout day. Similarly, your room is guaranteed to be available at 4pm but you can arrive as early as 1pm and get your wristband. You can rent lockers for your things or you can pay extra for late checkout. We went to the waterpark from 9-10:30, gave the children a quick shower in the room and moved all our luggage out to the car. The kids put on athletic clothes and went to the Howler’s Peak climbing course and then we left around 1pm. They could have easily stayed all day at the waterpark and changed in the locker room on checkout day. They do have a very limited number of cabanas available to rent in the waterpark area. I saw several larger families in the cabanas with babies or toddlers napping during the day. Most people stay 2 days. We have found one night to be sufficient for our kids. We typically check in early, stay the entire day on the water slides, have dinner, catch the evening entertainment and off to bed. The kids tend to sleep in a bit and are ready to hit the slides again the next morning. *Money Saving Tip: Summer and weekends are the most expensive times to visit as you might expect. Jan/Feb/March and Sept/Oct are the least expensive times to visit. 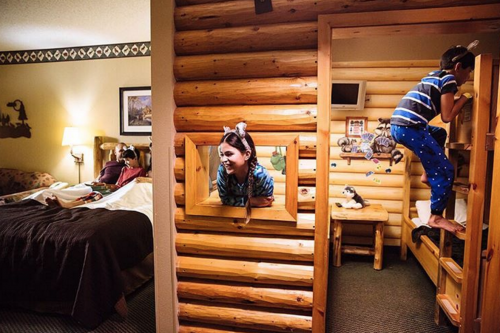 You can choose from all sorts of rooms for your stay at Great Wolf. The standard rooms just come with normal beds and sofas. You can upgrade to a themed room. The major difference with the themed room is that the kids get a semi-enclosed bunk bed area that has a TV inside. Our children absolutly love the bunkbeds. You can also splurge a bit more and get a whirlpool tub and fireplace suite or a loft suite. The rooms are clean and simple and come with a little fridge and a very basic coffee machine and microwave. 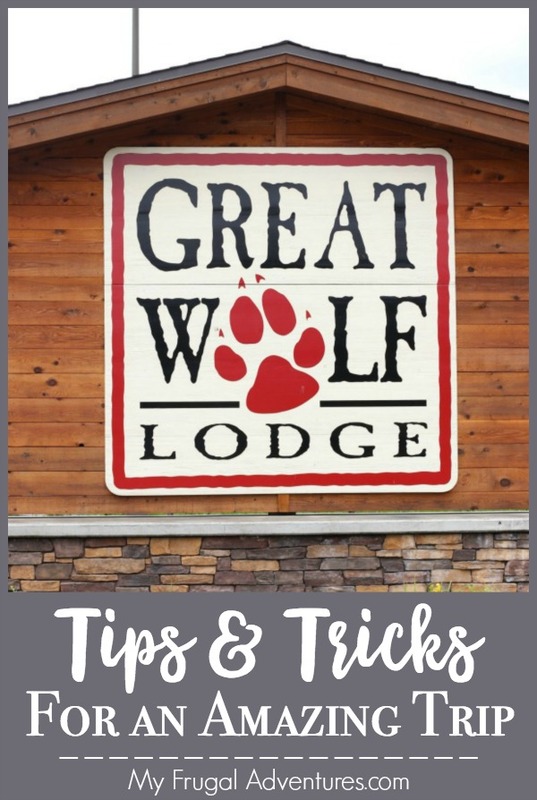 *Money Saving Tips: Often sites like Groupon or Living Social will offer discounted packages for Great Wolf. I post them when I do see them which is usually a few times a year. Another tip- the first time we stayed we paid for the room upgrade. The second time the hotel was booked solid and we actually called to see if they had any standard rooms available just in case. They had one Wolf Den Suite available and gave it to us for the standard room rate. Never hurts to call if the lodge is booked online- you might get lucky too. 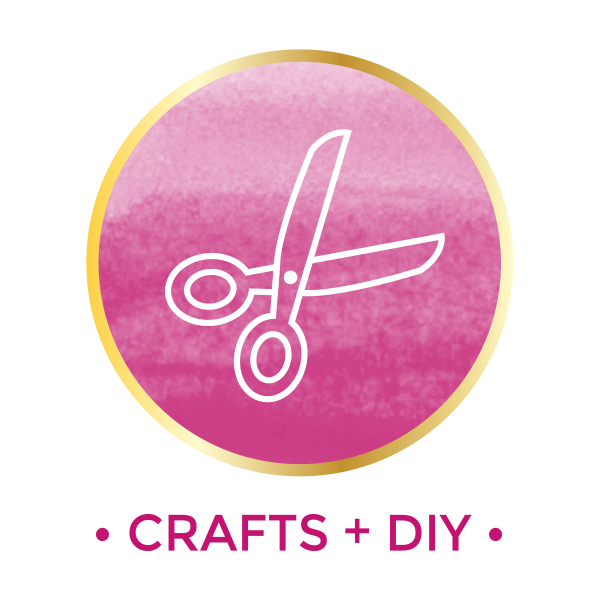 Another tip to save money is to register for special offers in advance and see if you get a good one. You will want to go to Great Wolf, select your resort location and then special offers and register your cell number or email. They should send out offers that might save you money on your stay. Lastly, you might ask if there is a group or conference at the lodge during your stay. We had a big conference of cheerleaders at our hotel so the lodge was full to capacity but the waterpark was not as busy as you might expect because all the cheerleaders were in training sessions. The restaurants were packed at night though once they got out. The lodges also have a pizzeria with take out pizza options that can be eaten in the main lobby area, by the waterpark or back in your room. We are major fans of pizza but skipped this option both times because it just didn’t look very appealing. 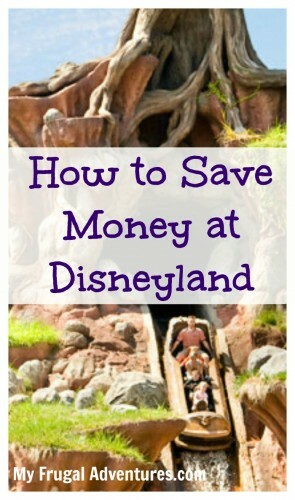 This is an excellent option though for saving money. 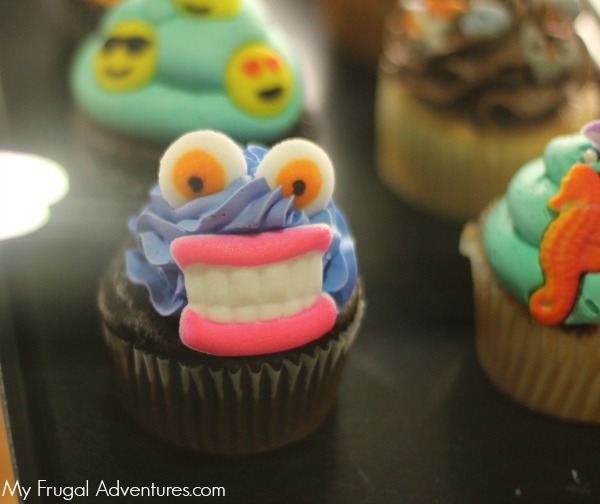 There is a sweet shop that features ice cream, dippin dots, cupcakes, fudge and some cookies and other treats. Last but not least there is typically a Buckets Craveables located in the water park with typical carnival type food such as pretzels, burgers and monster sized ice cream sundae concoctions with brownies and candy and whipped cream. You can bring your own food into the lodge. This last trip I saw as much food as I saw luggage in the lobby. I saw people bringing in pizzas from other restaurants, cases of water and sodas, Costco size snack packs of various items and so on. Personally I didn’t find the food very good inside Great Wolf and I didn’t find the prices to be that great. There was a fast food burger place in the same parking lot as our hotel and some people said that was decent. Our lodge was also on fast food row in Grand Mound so I was kicking myself for waiting in the mile long Starbucks line in the morning. I should have just driven to the real Starbucks down the street for better prices, quicker service and a larger selection of food items. Some lodges have Dunkin Donuts instead of Starbucks. The lodge will give you a list of activities and show times available. Our lodge had storytime at 8pm, a 9:30pm dance party, morning yoga, afternoon balloon animals and more. The first time we went, the storytime was very fun and the kids went down in PJ’s and sat around a neat structure in the lobby and listened to a teenager with a guitar tell them a story and sing. This time we missed the storytime because dinner ran late but made it for the dance party. I had a great time with two teenagers showing simple dance moves to popular songs and all sorts of little people dancing around. The music was a little suggestive for small children (“Timber” and a few Pitbull songs, “Turn Down for What” and also some Taylor Swift mixed in.) I danced like crazy and dragged my shy girls into the circle. We had a great time and honestly it almost felt like a Zumba class for me so an added bonus there. You can borrow board games from the front desk, there is a wee ones area with coloring pages and little activities. You can also purchase a t-shirt for $7 that a small child can color with fabric markers as a fun souvenir. The main entertainment is this MagiQuest game. Essentially you spend $32 buying a magic wand for your child and then you get a map with various tasks and places to visit. 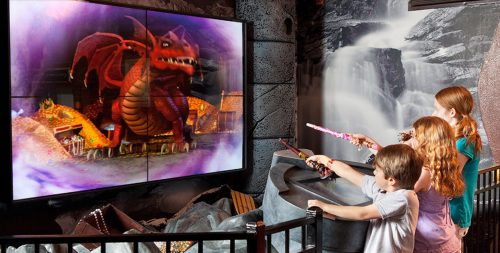 When you visit the wand will do something magical and you accumulate points. 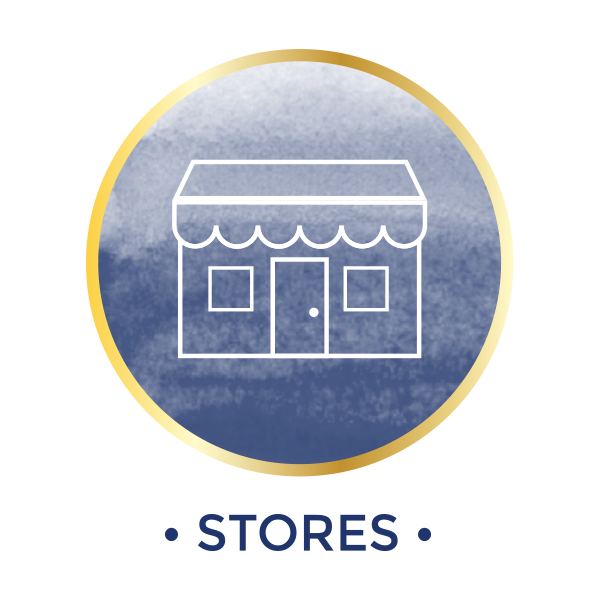 There are badges for those that achieve certain goals but no other rewards or prizes that I can see. We have skipped this activity both times but you will see tons and tons of kids running around waving the wands. The holiday season brings lots of activities from trick or treating to pictures with Santa. We stayed during summer once and during Christmas once. I don’t recall a huge difference in our experience between the two seasons but Christmas does bring pretty decorations and a slightly less crowded experience. ::SHOPPING: Two important things to note. When you check in you will get a wristband that serves as your room key. It also serves as access to the waterpark and you can charge items in the gift shop and restaurants. If you have older kids that might be wandering around without supervision, you might explain that whole charge to the room concept before setting them free to roam. 🙂 The children in the party also get little wolf ears to wear. This might save you a bit on souvenirs and my children were thrilled to pieces with the ears. The kids wear them all over the Lodge. There are a few gift shops with the standard t-shirts and mugs and such. Our lodge had a shop with dirt you can purchase and go mining for rocks that looked fun. The lodges have an adult spa and Scoops salon for children. The salon is darling but I personally thought the prices were pretty high- $39 for a children’s manicure for example. 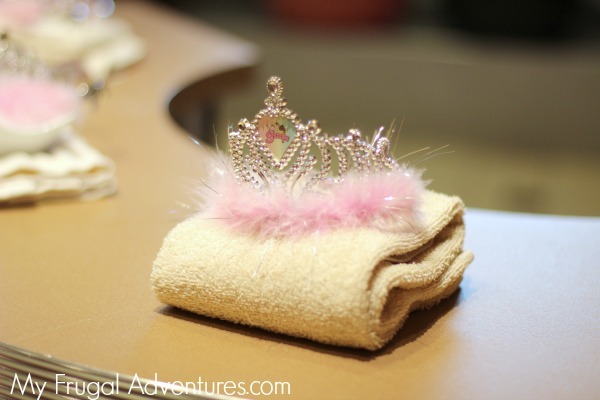 You do get to keep the polish though and they have cute little robes and princess crowns for little ones to wear. ::WHAT TO PACK: Again you will likely be inside for most of your stay and they keep the lodge pretty warm. We packed a few swimsuits, flip flops, cover ups and goggles were key. My kids wore goggles the entire time and I actually wear contact lens so I had goggles for the water slides. The Great Wolf provides towels for use in room and larger ones for the water park area. You might consider fun PJs for the evening activities such as storytime and exercise clothing for the morning yoga or for hitting the fitness center. Our lodge had a ropes/climbing course and we were glad to have leggings and tennis shoes for the kids. You need closed toe shoes to go on the ropes. And don’t forget your camera! You can totally take a camera into the water park area to get fun shots of the kids. I took my DSLR and my phone- I was just really careful about not getting splashed. All in all I would say it is best to just bring the minimum amount you can into the waterpark. You can rent lockers or set things up on a table but really your hotel room is a 2 minute walk away. Overall, we packed pretty light with just a few snacks and several bottles of water. If you want to do laundry, you might consider grabbing those packets of Tide from the travel section at your favorite store. I didn’t check out the laundry facilities at our resort but I know they were available. Thanks so much for the article! I felt like you wrote it for me lol. We are going to the grand mound location next weekend and I feel a little more prepared!! Yeah Mae! I hope you have fun and come back to share your own tips 🙂 There isn’t a lot to Centralia but there was a lot of fast food that I saw on the road leading into the Lodge. I know this is an older post,but… We’re considering going to the one in Texas (Dallas area). We have a 13 year old boy ( very much into gaming, computers, etc.) that I think would enjoy the “Quest Adventures”? And, we are inviting our 21 year old daughter. My husband and I think the “Quests” seem fun for even us, but does anyone know what age they’re marketed for? My son has Asperger’s (mild), so he’s okay with things that are just slightly younger than he is, but he also has major social anxiety. Would the Quest games be too young for our family (both of my kids)? I know the water park is suitable, but I’m not sure if my son will like it (if it’s too crowded, then he wants to hide). Have fun on your trip! I bet you love Great Wolf. I absolutely hate crowds and confined spaces but I don’t find Great Wolf overwhelming so I hope he feels the same. Thank you so much for your tips! Headed there this weekend and I’m feeling prepared! So glad Kourtney! I hope you have a wonderful time. I have been to this GWL several times and this is a great description of it. I would suggest to buy the refillable plastic travel cup (with a handle). 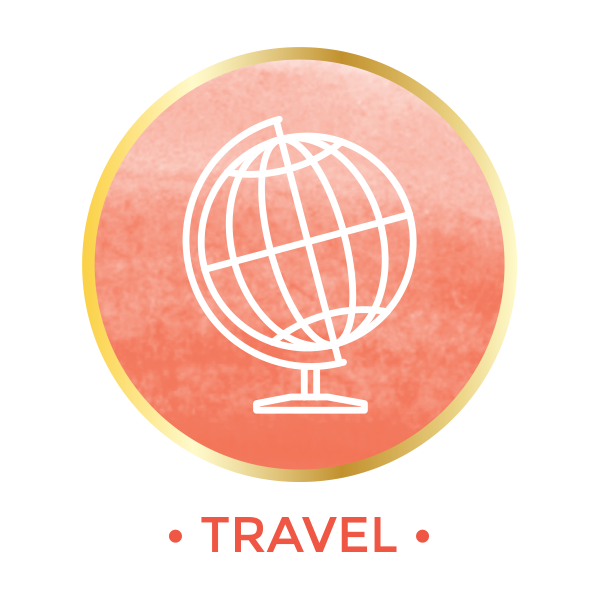 It pays for itself by the end of your trip, is a nice souvenir and can be brought back the next trip to use for free. There is pop, juice, and Icees available. We’ve had ours for 3 years. I also cook at home and bring dinner to be microwaved in the room. After the waterpark it’s nice relax in the themed room for a while, them go back downstairs in our jammies for activities. Also if you go on or near your child’s b-day, they get a special wristband for free ice cream during their entire stay.